James Franklin, Olathe North: There was really no question about this award. Franklin's efforts in 2009 were, quite frankly, Simone worthy--and maybe better. If he is not awarded the Simone Trophy for 2009, then the validity of the award should be questioned. Olathe North was the best team in the Kansas City Metro and Kansas Class 6A this season, and Franklin was the star of the team. Just in case you're not convinced here is a rundown of Franklin's game by game production. **Franklin's 340 rushing yards in week three broke the Olathe North school record for rushing yards in a game. **The 247 yards Franklin put up in week 11 broke Darren Sproles school record of 5,230 career rushing yards. Franklin finished his own career with 5,916 rushing yards. **In his 36 game career (I know this is a season award, but his career stats were too impressive to pass on) Franklin averaged 7.8 yards per carry, 164 yards per game, and 1.8 touchdowns per game. Franklin's career numbers at Olathe North will be hard to match (granted we were saying the same thing about Sproles' high school career a decade ago) and in my opinion he is the obvious choice as the Sunflower League's Most Valuable Player for 2009. Also, I won't fail to mention that Franklin was running behind one of the biggest and most talented offensive lines the league has seen in years (Oliver Venegas, Zach Maggard, Jake Carroll, Josh Finley, Lucas Vincent)--and ultimately the holes they opened up fed Franklin's monster season. 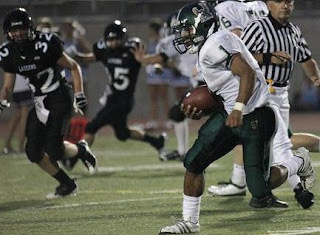 Camren Torneden, Lawrence Free State: Last season I felt Torneden was worthy of being the Sunflower League MVP after he took the reigns at quarterback in week three and led Free State to a State Runner-Up trophy. Although Free State didn't advance as far in 2009, I still feel that Torneden had as good of a season--its just that James Franklin had arguably the best individual season of the decade. Since Franklin took home the MVP (and was therefore not eligible for the other awards) Torneden get the honorary Offensive Player of the Year Award. His stats were once again insane--1,362 passing yards and 13 touchdowns, in addition to 935 rushing yards and 11 touchdowns. Torneden also had three punt returns for touchdowns. In his two year career as a starter the 5'7" quarterback passed for 2,318 yards and rushed for 2,302. 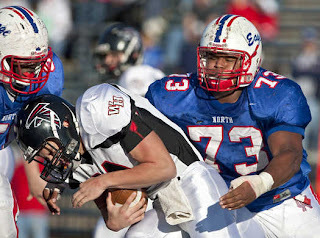 Lucas Vincent, Olathe North: The Missouri bound Vincent did not fail to impress in 2009. After coming off of an amazing junior campaign it was obvious Vincent was going to be facing double teams on a weekly basis, but the senior responded well. Vincent tallied 40 tackles (17 for loss), four sacks, and six forced fumbles on the season. The numbers pushed his career totals to 110 tackles (35 for loss) and 18 sacks. Vincent's presence in the center of the Olathe North defense created issues for opposing rushing attacks all season long. In fact, no team was really ever able to successfully run through the middle of the Olathe North front. The 6'3", 280 pound Vincent was an immovable force in 2009, good enough for defensive player of the year. 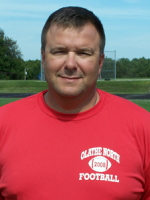 Pete Flood, Olathe North: Early in the season I felt this award could go to a variety of coaches. Olathe East's Jeff Meyers was leading a very young and inexperienced team to a solid season, and Olathe South's Jeff Gourley was making huge strides with his team in year two. However, as the season progressed it became more obvious that the dominance and consistency Olathe North was displaying was hard to ignore. In the end I felt Flood was the most deserving candidate as Coach of the Year. Granted, he was likely working with as much talent as any coach in the league, but it takes more than just talent to guide a team to a 13-0 record and 6A State Championship. Since taking the helm at Olathe North in 2006 Flood's record as a head coach is 35-10, and he is now the only active head coach in the Sunflower League who has won a Kansas state championship as a head coach. This game didn't necessarily have major playoff or state title implications, but looking back on the season it may have been the most competitive back and forth battle of the year in the Sunflower League. Both teams were 2-3 heading into game, and a win the week before the start of district play was huge for both teams. SM North got the scoring started when Joe Haas punched in a short touchdown run after a long SM North drive, to give the Indians a 7-0 advantage. In the second quarter SM South was able to tie things up when Grant Hilton completed a 30 yard touchdown pass to an outstretched Antonio McFadden in the corner of the endzone. In the third quarter SM South was able to compile a solid drive (mostly thanks to the running of Johannes Swanepoel) that ended with a one yard touchdown plunge by Hilton. The score gave SM South a touchdown advantage. The trickery came out in the fourth quarter. Sitting on their own 11 yard line, SM North's head coach Ryan Majors made a gutsy reverse pass call. Quarterback Kyle Goodburn ran left, and pitched the ball to receiver (and former quarterback) Athur Rucker who reversed to the other side of the field and hit receiver Ryan Finazzo on a deep route. Finazzo was able to take it to the house, which tied the game up at 14 all. SM North botched a field goal later in the quarter, and the game went into overtime. In overtime, SM North got the scoring started on a 27 yard field goal by Goodburn. Up 17-14, the SM North defense was unable to hold back the SM South rushing attack. Three straight carries by Swanepoel resulted in a SM South touchdown, and victory, 20-17. The game wasn't the highest of stakes, but it was a classic example of the heated inner-school district rivalries that exist in the Sunflower League.